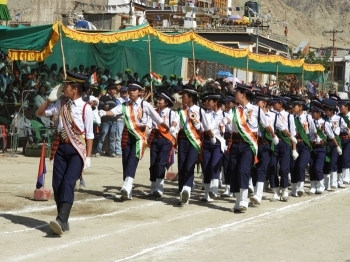 Like other parts of the country, 71st Independence Day was celebrated with great zeal and enthusiasm in Leh on August 15 at Polo ground, Leh. Addressing to the public after flag hoisting, Dr. Sonam Dawa, CEC said that the Independence Day was most earned thing by our freedom fighters and we should feel thankful for those who laid down their lives for the day that we are enjoying. “We know that the situation has been not going well in Kashmir from last two years and many of our Indian army has to lose their lives. Today on this occasion, I pray for the departed soul and encourage their family members that we are always there for any kind of help” he said. Highlighting the Leh district budget, he said that for the first time this year budget has sanctioned earlier in February with an additional ₹11 crore funds as compared to the previous years. And the plan for ₹129.77 Lakh has been approved among which 50% of the budget is received. However giving detail about the future plans he said that new scheme named Atal Bihari Mission has been approved for the development of Leh town under which ₹42.00 crore has been approved. Among which, ₹4.00 crore for drinking water, ₹2.50 Lakh for Parks and Garden, ₹27.00 crore for Multi tier parking, ₹2.00 crore for Fly over near SNM hospital, ₹70.00 Lakh for Traffic Management and ₹2.00 crore for Sewerage system has been kept. In addition, to treat the waste water a tie up with the Banglore based organisation named GOWDA has been made. Under Tribal Sub-Plan, two villages Wanla and Hanu have been sanctioned ₹5.00 crore each for the development and work is going on. Under Prime Minister's Development Package (PMDP) ₹50.00 crore has been sanctioned for the construction of Chilling Bridge which was washed away two years back due to Puktal river blockage,” he added. He also congratulated people over becoming Leh as the cleanest town in J&K, best tourist destination, open defecation free and cleanness hospital in J&K. At the end, prizes were distributed among the positions in march past and cultural programme. The award was also presented to the persons who have worked diligently and extraordinary in different fields.